This ceramic Nativity set was hand-painted by the author and has been the main feature for our household decor for over 30 years. This time of year we expect to see the story of the birth of Christ played out in humble means by children in small churches, or by freezing “actors” in “living” nativity scenes, or in glitzy performances by mega church choirs. Even the Radio City Rockettes present the Christmas story at the end of every performance. 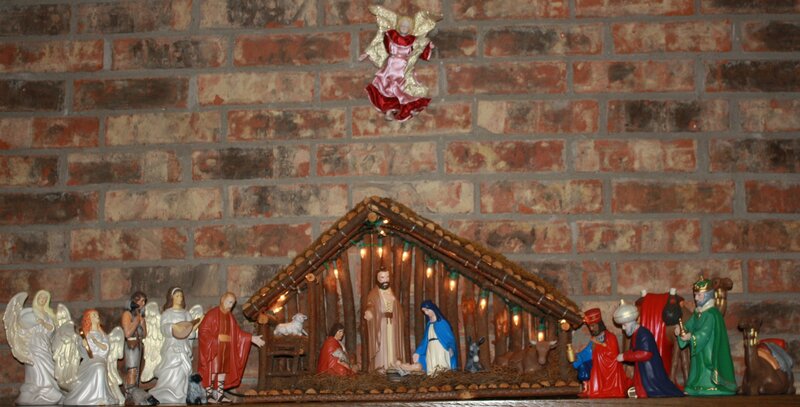 All of these presentations begin with the typical scene of Mary, Joseph, and the baby Jesus in a stable surrounded by farm animals, and conclude with an unbiblical menagerie of shepherds, wise men and angels all worshiping the Christ child. While this serves as a sweet reminder to get one focused on the true meaning of Christmas, it somehow misses the awesome significance of this event. The Word, the Logos, the revealed Wisdom of God, was manifested in a tiny, helpless infant. This now revealed Word, our verse tells us, existed with God at the beginning of time (John 1:2), and He was, in fact, very God. “All things were made by him; and without him was not any thing made that was made” (John 1:3). “Who, being in the form of God, thought it not robbery to be equal with God: But made himself of no reputation, and took upon him the form of a servant, and was made in the likeness of men” (Philippians 2:6-7). And so, “the Word was made flesh” (John 1:14) in the form of a helpless baby – a baby that, though He existed in eternity past, entered and grew in His mother’s womb from a zygote to a fetus that had to fight His way through the birth canal. God came as a baby that had to be nursed at His mother’s breast. A baby that had to be carried everywhere He went. A baby that had to have His diapers changed. This was God in human form – the Creator of heaven and earth cloaked in human flesh as a tiny babe. Is that not incredible! The idea of it all is inconceivable! Yet, this was His plan from the beginning, so that “as many as received him, to them gave he power to become the sons of God, even to them that believe on his name” (John 1:12). “And being found in fashion as a man, he humbled himself, and became obedient unto death, even the death of the cross” (Philippians 2:8). That is the message that is often overshadowed in the scenes and sounds of the season. This Christmas, try to think beyond the nativity scene. See the babe for the God He truly is, and be awed that He did this for you. “Without Him was not anything made that was made . . . And the Word became flesh and dwelt among us, and we beheld His glory, the glory of the only begotten fo the Father . . . .” More amazing that we can ever appreciate! Hallelujah!